SUV sales remain strong, but the GMC Acadia is in a stream of its own. In the wet: 2017 GMC Acadia Denali AWD. For the first time in eight years, the US auto industry is experiencing declining sales. Fortunately, it isn’t a significant drop — just 1.5 percent year-to-date through April. The pullback isn’t entirely unexpected nor is even across all segments — demand for all cars continues to shrink, while one segment, in particular, is still expanding — SUVs. Sales of utility vehicles show few signs of letting up, with growth especially strong among small models. Demand for midsize and large SUVs isn’t as robust, but there is one very telling exception: all-new or updated models are benefiting the most. The GMC Acadia is one such new model as this now second-generation SUV rolled out to start the 2017 model year. 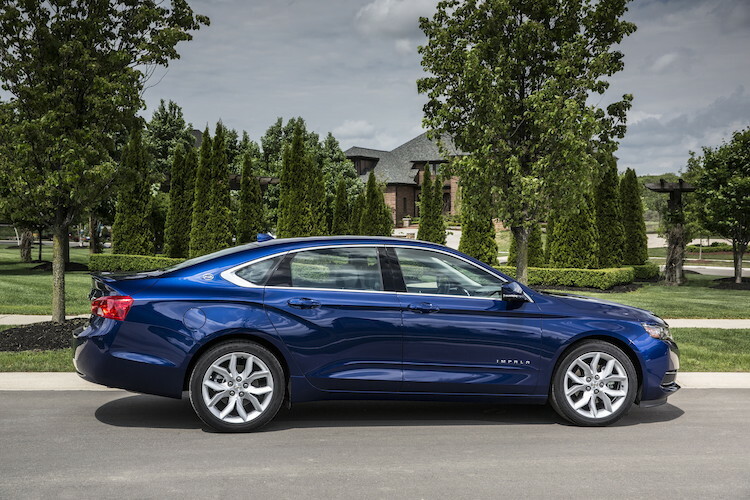 Sales are up by over 50 percent, while its two nearest stablemates — the Chevrolet Traverse and Buick Enclave — are experiencing slight declines. But there is a noteworthy reason for that — the new GMC got a one year jump on the duo; both are new for 2018. The 2017 GMC Acadia is available in SL ($29,995), SLE-1 ($33,375), SLE-2 ($35,995), SLT-1 ($39,275), SLT-2 ($42,675), and Denali ($45,995) grades. Prices include a $925 destination and handling fee. 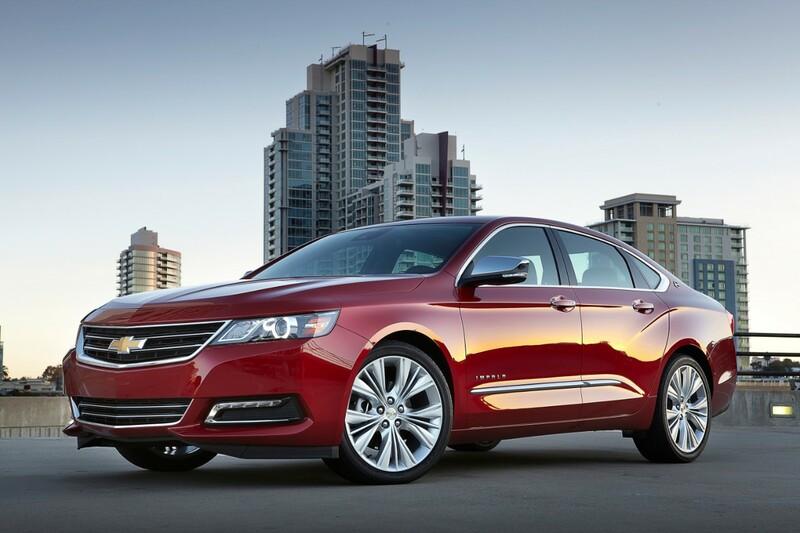 Add $2,000 to $3,100 for all-wheel drive, depending on the trim. The SL grade is front-wheel drive only. There are two other 2017 Acadia models to consider, although you might have a difficult time finding them on GMC’s website. 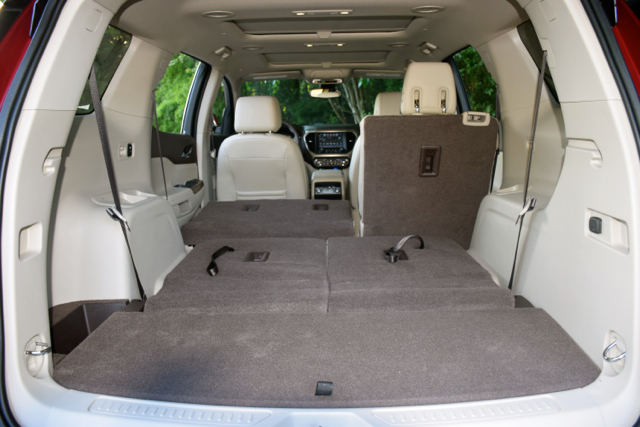 The Acadia All Terrain is a five-passenger version of this typically seven-passenger SUV. It offers a distinctly edgy design with unique wheels, a sport interior, and an innovative storage system featuring a pair of under-floor storage bins. You have a choice of two sub-grades — All Terrain 1 ($39,880) and Terrain 2 ($42,375). GMC treats both as package options for the SLE-2 and SLT-1 grades, respectively, so that’s where you’ll want to look. As if that isn’t confusing enough, there is also the GMC Acadia Limited. However, this model isn’t based on the new Acadia. Instead, GMC continues to produce well-equipped copies of the first-generation Acadia under the Limited umbrella. For this now 11-year-old design, you’ll pay $45,170 to acquire one. My test Acadia Denali with all-wheel drive began at $47,070. You’ll find several “extras” here, including a dual skyscape sunroof ($1,400), a technology package ($1,395), a continuously variable chassis ($1,200), and Crimson Red tintcoat paint ($495). The final price came in at $52,485 and that’s at the top end of the segment. The Denali trim has been a boon for GMC as it represents the peak of glitter and profits. Chrome or chrome-like material embellishes the exterior, beginning with a unique honeycomb grille, lower grille trim, window accents, rocker panel garnish and door handles, as well as on the rear liftgate, bumper, and exhaust ports. Chrome wheels, roof rails and badging complete the enhanced look. Inside, most models offer a 2+3+2 seating layout, same as before. But the wheelbase is shorter by 6.4 inches, a loss shared in part with the standard cargo space, nearly halved from the previous model. The 2017 Acadia is smaller to differentiate it from the Buick Enclave as both models share the same showroom. That said, you can fit seven people inside the 2017 Acadia, thanks in no small part to a second-row 60/40 seat that slides and tilts forward, for ease of access to the third row. That third row seats two and is ideal for teens — legroom is tight and the seat backs are thin. Of course, the best seats are up front with the driver and passenger sufficiently pampered. Both seats offer minimal bolstering, but sufficient back and hip support. 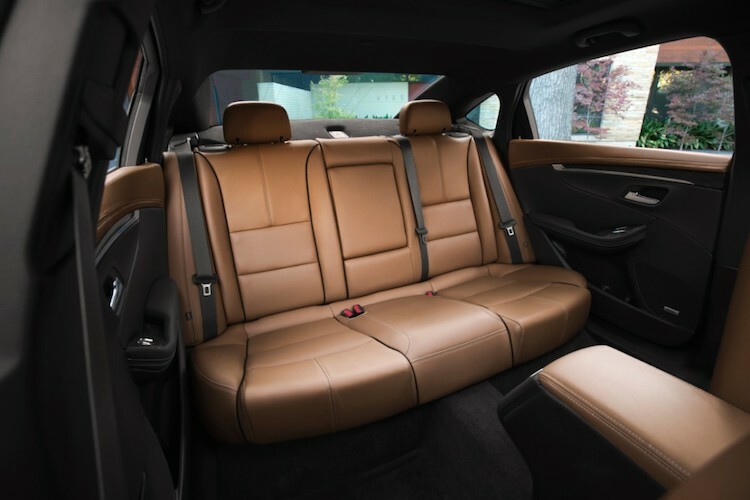 The seats are power operated, with lumbar support and offer both heating and cooling features. The outboard second-row seats supply heating elements as well. 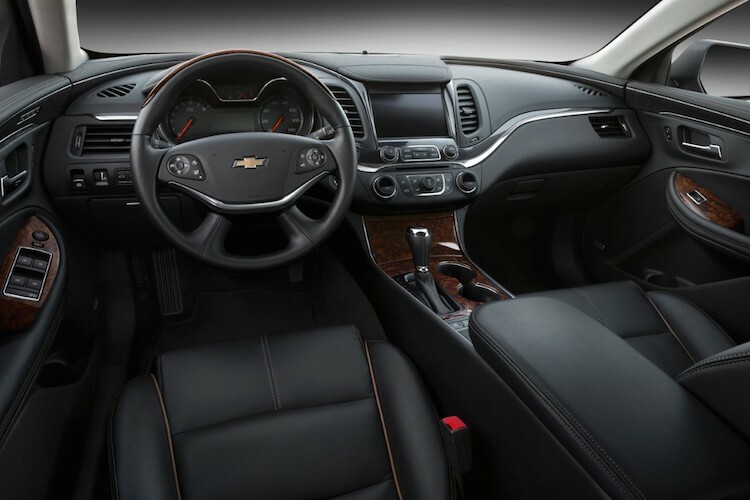 Leather covers the seats and wraps the steering wheel. Soft touch materials and molded plastics are in abundance across the dashboard, on the door frame, covering the front console, and the roof pillars. 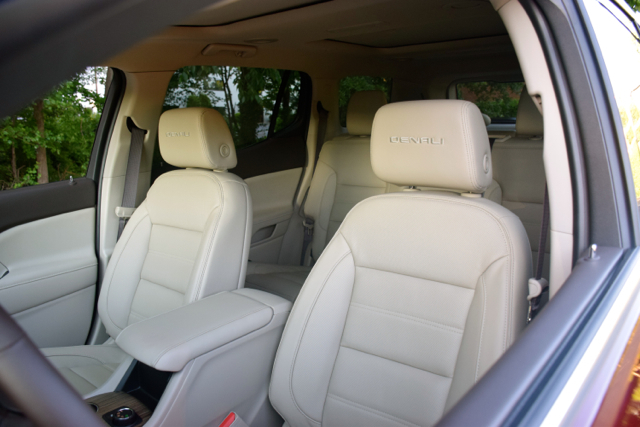 This is one significant reason why you cannot very well call the Denali a “luxury” line — it offers premium features, but stops short of matching what you’d find in a BMW, Lexus or even a Cadillac. 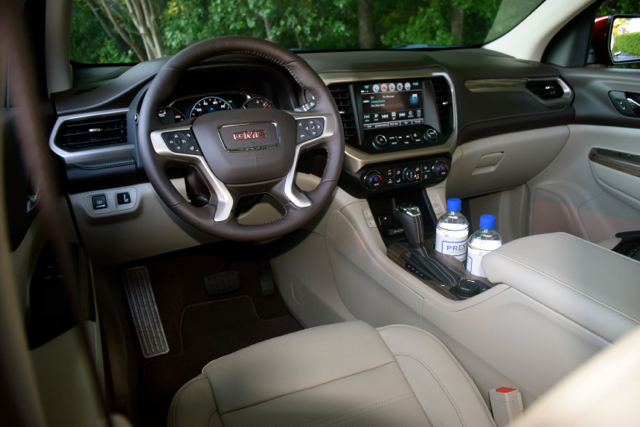 GMC makes excellent use of space inside the Acadia. You’ll find numerous places to stash a phone, hide a purse or to place drinks. 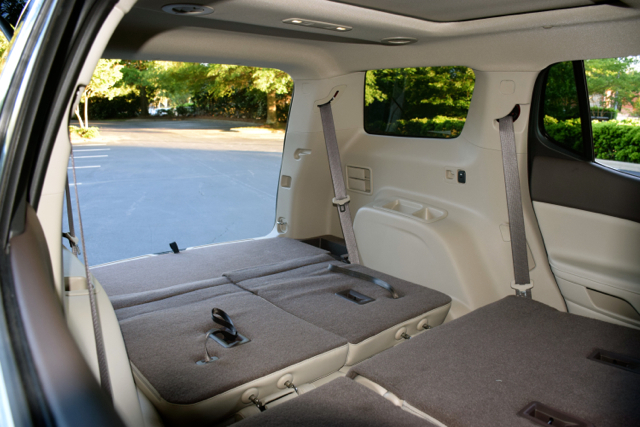 For example, the second-row doors feature upper- and lower-level drink holders, and additional open storage compartments. You’ll also find a pullout storage drawer at the rear of the center console for second-row passengers. This makes for an ideal place to store electronic devices or house connection cables. Third-row passengers have two bottle holders and open storage space too. Underneath the rear storage area floor is a cargo management system — providing additional places to hide things. The 2017 Acadia receives high marks for technology. This model offers keyless entry and push-button start, five USB ports, a 4G Wi-Fi hotspot, and is Android Auto and Apple CarPlay compatible. Further, you can also opt for the IntelliLink infotainment system with navigation. A rearview camera and a seven-inch color touch radio display are also standard. Bluetooth connectivity, smartphone pairing, and an available eight-inch color display are other considerations. OnStar, GM’s diagnostic and emergency response system, includes a five-year free subscription. Other features available, depending on trim, include a power liftgate, a 120-volt power outlet, a rear-seat entertainment system ($1,995) and wireless charging ($375). When it comes to safety, the 2017 Acadia boasts a Top Safety Pick rating from the Insurance Institute for Highway Safety (IIHS). On a scale of five stars, with five the top rating, the Acadia earned a five-star rating from the National Highway Traffic Safety Administration (NHTSA). 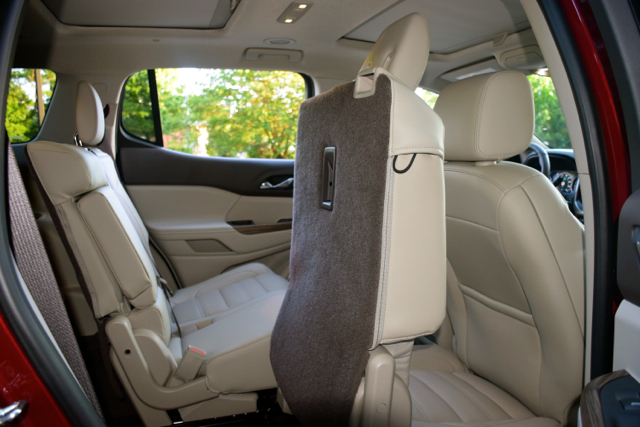 Besides a suite of airbags, every model comes equipped with “safety seat” what alert drivers when an obstacle is in the way. 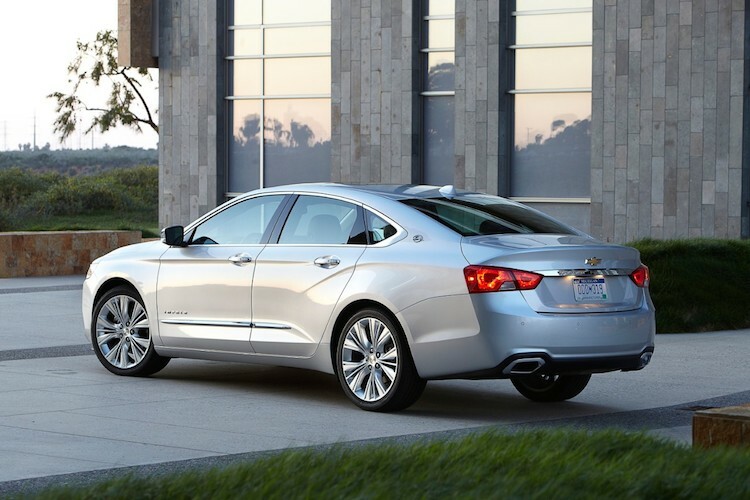 Driver assist technologies come with the two top trim-level models. Here, you’ll find front pedestrian detection, forward collision alert, lane-keep assist, rear cross traffic alert, side blind zone alert with lane change alert, and low-speed front automatic braking. I haven’t tested the 2017 Acadia with the base 2.5-liter four-cylinder engine, so I cannot comment other than to say the V6 will likely suit the needs of most shoppers. After all, when you’re used to a powerful V6 in this segment, sacrificing 117 horsepower in exchange for a modest improvement in fuel efficiency doesn’t line up. Chances are that a fully loaded Acadia with the base engine would labor terribly when climbing hills — an important point to consider. My test Acadia Denali 4×4 offered the 3.6-liter V6 paired with a six-speed automatic transmission. What surprised me is that an eight-speed isn’t offered (the upcoming 2018 Enclave will pair this engine with a nine-speed automatic, so there is hope). In any case, the V6 serves up an ample amount of power, although (again) the transmission occasionally hesitates before upshifting. The Acadia feels almost truck like, though this is a crossover SUV. Personally, I like the feeling as it imbues confidence and makes this SUV seem sturdier. This vehicle can handle light-duty off-road work with ease as you dial in all-wheel drive. Otherwise, the SUV operates chiefly in front-wheel drive. 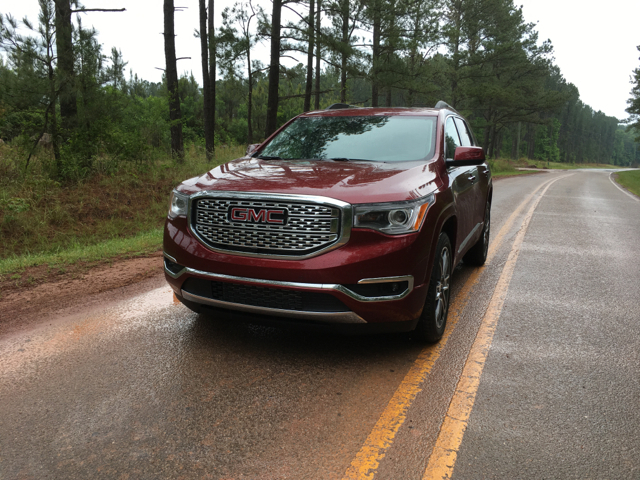 GMC claims the All Terrain version offers all-wheel drive with twin-clutch for improved driver control as it directs torque to the wheel with the best traction when road conditions are poor. Besides considering the Chevrolet and Buick, the GMC Acadia should be cross-shopped with the following models: Mazda CX-9, Ford Explorer, Kia Sorento, Dodge Durango, Toyota Highlander, Hyundai Santa Fe, Honda Pilot, and the Nissan Pathfinder. An all-new Volkswagen Atlas debuts in June — you can read my preview here. As for the Acadia, beginning your search at the SLE-2 level brings in a power liftgate, fog lamps, heated front seats, and an eight-way driver’s seat. Add in all-wheel drive, a driver alert package ($790), and the trailering package ($650) and your price will come in at $41,450. Discounting should keep your final price in the high-$30,000 range. The all-new GMC Acadia is smaller, 700 pounds lighter, and more efficient than the previous model. The Acadia’s slightly smaller footprint will be welcome by those who think that even most three-row midsize SUVs are too large, with the new model delivering an all-around pleasing and modern package. Manufacturing Plant Spring Hill, Tenn.